Down by four goals in the fourth quarter and your goalie has over twenty saves. There is another save and he takes a pass back from one of his defensemen and carries the ball into the other team’s zone and dishes it. Typical hustle play in a tough game to try and shift momentum and close the gap and win. Except the goalie cuts to the goal after dishing the ball catches a pass back, shoots and scores. It is now a three point game with twelve minutes left. What? Did the just happen? Yes it did. Ladies and gentlemen please meet Brett Queener, goalie for the Florida Launch. Even those who are not fans of lacrosse cannot deny the athleticism and competitive steak displayed by Queener. It was not a lucky pass thrown down the field over a distracted keeper that wandered out too far from the cage. It was a shot on a talented keeper who saw Queener cutting towards him. It should be noted that this is not the first time the Florida Launch Goalie has scored a goal. He is the leading goal scorer among goalies. 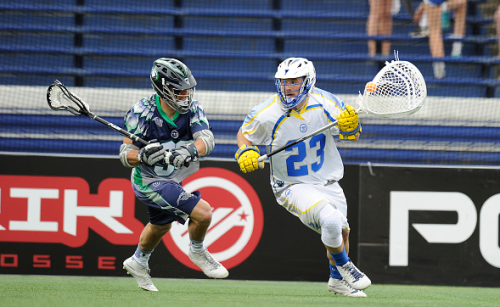 Say what you want, but players like Brett Queener make the MLL one of the most entertaining sports leagues to watch. Queener is just one of many such players in the MLL. Brian Spallina, one of the most polarizing players in the MLL, is back in New York and playing for his brother Joe, head coach of the Lizards. Before you start claiming nepotism, you need to know that Brian has six championship rings. Six rings. Many players go their whole career without even coming close to one. Again that is six rings earned with hard work, sweat, and blood. In Mr. Spallina’s case, it is usually the other team’s blood more than his. Critics refer to Brian, as a dirty player who hits late and cheap shots opponents. He owns the league record for penalty minutes but his ground ball total is one of the highest as well. I have never met him in person, but have met his team mates and they speak volumes about his leadership and locker room presence. As with any intense player, there will be detractors and critics, but his career stats indicate a hard working blue collar, no nonsense professional and a winner. Greg Gurenlian started lacrosse late, according to him, and took to the face off position due to his wrestling background. After some serious work in the weight room and dedication to his craft as a face off specialist he literally transformed into “The Beast.” A fan favorite and regular on social media Gurenlian speaks his mind with a sharp wit and pulls no punches. The Beast is currently the face off leader in the MLL and ranks high on the ground ball list. He plays with a passion to be the best at his position and prove that he “should be there.” Commentators agree that he is one of the most potent weapons in the league due to his ability to dictate possessions. Greater possession of the ball means more opportunities to score and keep the ball away from the other team. Gurenlian played through last season and the World Games with a bad shoulder and never complained and was still the FOGO of the year. He has set the standard high for face off specialists and currently leads the movement, with his friends Jerry Ragonese and Chris Mattes, to legitimize the position and make it one of skill and not cheating. Despite all these accolades, Gurenlian is hungry for a championship ring and may well earn one this season. Three players with different back grounds and personalities, but the common trait they all share is love of lacrosse. That passion translates into a high level of play that gives us fans a truly entertaining product to watch. Queener, Spallina, and Gurenlian are just three of many players in the MLL with interesting stories and personalities. The league makes the players available for fans after the games as well as posting quick interviews on its website. High caliber lacrosse with approachable players makes me forget about that other sport claiming to be our pastime.